Apple has launched Business Chat for iMessage in developer preview today at the WWDC, VentureBeat is reporting. Using the iMessage App Framework, businesses can integrate iMessage apps into a Business Chat experience to deliver services. 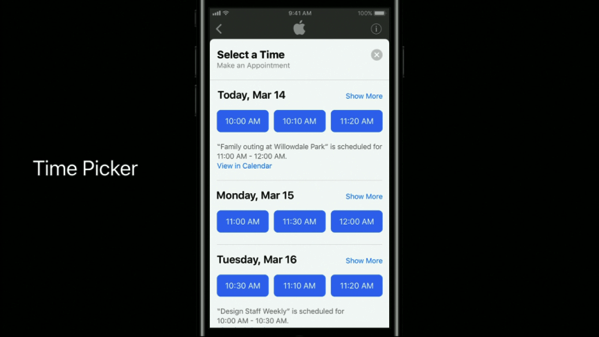 This will allow Message icons to appear alongside the names of businesses in Siri, Spotlight searches, and Maps for quick chat with online or offline businesses. The source explains that customers must send the first message to initiate a Business Chat conversation. But once it begins, a business can schedule appointments, send notifications, make sales, and offer a range of other business services. During a Business Chat, predictive text will surface personal information the customer can share with the business, like phone number or email address. There’s also a Time Picker feature in Business Chat. The Time Picker feature in Business Chat allows customers to select from open appointment times with a business. List Picker lets you select things from a list, like a group of items for sale. Apple Pay can be used to provide payment, shipping, and contact information. A Hide Alerts option will be available to customers to silence notifications from a business. Delete a conversation and the business can no longer reach that customer. Business Chat will be available on iPhones, iPads, and Apple Watches running iOS 11 or later.